Sweet Sewn Stitches: HAPPY HALLOWEEN!!! It's E's first real Halloween complete with costume and Trick or Treating! He had so much fun dressing up...left it all on too! 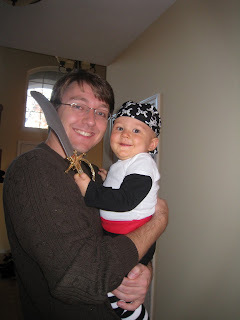 He clutched his pirate sword tight through the scary houses around the neighborhood. Definitely a fun night! Hope you all had a Happy Halloween!! !